If you have been a long time reader of my blog, you probably noticed that I have done a few reviews with Tropical Traditions. It is one of my family's favorite stores. We love everything we have reviewed for the company and the Powdered Laundry Detergent was no exception. As soon as the Powdered Laundry Detergent came, we tried it with a load of our laundry. Instead of using paper napkin, we use cloth napkins. So whenever we do a load of laundry, we would toss in some cloth napkins with our laundry. Because DD is pretty messy when it comes to eating her meals, the cloth napkins get pretty gross sometimes. I thought that tossing in the dirty cloth napkins was a pretty good way of testing how well the Powdered Laundry Detergent works. Well, it worked wonderfully! As a matter of fact, it works so well that I told DH he needs to pick up more of it before we run out. We love Tropical Traditions' products so much that we recommend the company to all of our friends and family members. To buy their Powdered Laundry Detergent, be sure to stop by its website to make your purchase. Many thanks to Sandra of Tropical Traditions. She has generously offered a 5 lb. 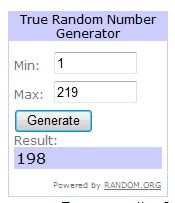 container of Powdered Laundry Detergent as a giveaway prize to one of my lucky readers (US and Canada residents only please). 1). Please go to Tropical Traditions and then come back to tell me about another product you would like to try (you MUST be a public follower of my blog to enter this giveaway, and your profile can not be set at private). 2.) Blog about my giveaway- with a link back to here, when you leave the comment make sure you include the URL of where your post of my giveaway is. Please do not copy and paste my review over to your blog, please write about why you would like to win this giveaway and provide a link back to this post. The Contest ends May 17th, 2010 at 11:59pm PST. Blogging about my giveaway earns 2 additional entries. 6.) Retweet this review and giveaway by clicking on the "retweet" button on the bottom of this post. (Right next to where you click to leave me comments). After you retweet, please leave me the url of your tweet so I can check. If you do not know how to check your tweet url, please read this post for step by step instructions. You can retweet once a day for 1 entry each time. NOTE: You can only use the "retweet" button once. 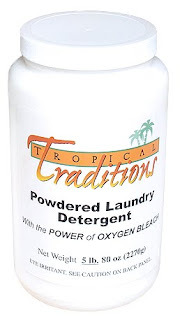 If you want to retweet everyday, please tweet the following: " I want to win Tropical Traditions Powdered Laundry Detergent@ http://www.sugarpopribbons.blogspot.com/ " for 1 additional entry per day (please leave me the url so I can verify your tweet). 7.) Follow Tropical Traditions on Twitter for 1 additional entry. I follow your blog. I would like to try the glass and surface cleaner. I'm publicly following your blog as "libbeh" through GFC. The other product that I'd like to try is their pet shampoo. One of my dogs has a skin allergy, and it's been costly and lengthy adventure to find the right shampoo for him. I'd like to try the Benefect Botanical Disinfectant. I would like to try their coconut oil or one of their cleaning products. I'd like to try the Baby Silk Moisturing Lotion. I am a follower and I want to try the cocoanut peanut butter! I would love to try their coconut flour. Im a public follower, Organic Apple Sauce! Public follower, and I would also like to try the Lavender Moisturizing Lotion. I would like to try out their organic honey too. I like the 32 oz All Purpose Cleaner. a public follower of blog through Google Friend Connect. I would love to try the coconut flour!! Sounds wonderful! I would love to try the Mint Teeth Cleaner. I’m your friend on Facebook (Elena Shkinder-Gugel). Follow Tropical Traditions on Twitter (@spelena). I'd also like to try the Pet Shampoo. I'd like to try Organic Apple Sauce since I love apples so much. I would like to try their organic coconut flakes! I sent a friends request on fb. Raw Meat Pet Treats are something I would love to get for my fur babies to try! I am your FB friend, Tofu Fairy. Organic Spaghetti Sauce - Unsalted would be great to try as its so hard to find unsalted food! oooh i'd like to try the coconut peanut butter. yum! I also want to try the Organic Soy-Free Eggs. Thanks for the giveaway...I would like to try TT's Organic Teeth Cleaners.